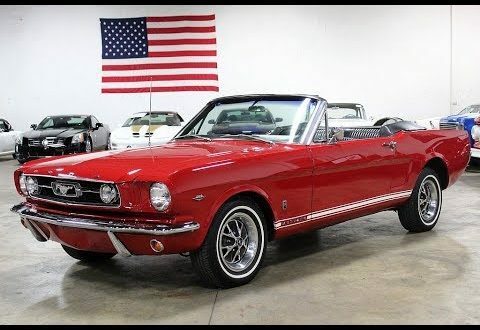 GR Auto Gallery is pleased to present this 1966 Ford Mustang GT for your consideration. It is dressed in a Red exterior paint over Black vinyl interior. This Mustang is equipped with the 289ci 225hp four-barrel paired to an automatic transmission. The previous owner hung on to the vehicle over 30 years, through his ownership a full frame-off restoration was completed. Features include; power front disc brakes, power top, GT equipment group, dull length console deluxe steering wheel, and a dual exhaust system. When it comes to cruising in a convertible a Mustang is hard to beat, especially one that fires up and drives like it should! Please call or email us today for more information. The Ford Mustang is an American car manufactured by Ford. It was originally based on the platform of the second generation North American Ford Falcon, a compact car. The original 1962 Ford Mustang I two-seater concept car had evolved into the 1963 Mustang II four-seater concept car which Ford used to pretest how the public would take interest in the first production Mustang. The 1963 Mustang II concept car was designed with a variation of the production model’s front and rear ends with a roof that was 2.7 inches shorter. Introduced early on April 17, 1964 (16 days after the Plymouth Barracuda), and thus dubbed as a “1964½” by Mustang fans, the 1965 Mustang was the automaker’s most successful launch since the Model A. The Mustang has undergone several transformations to its current sixth generation.